As 2012 draws to a close, it is time to reflect on what I have and haven't achieved this year. I started this blog on New Year's Day and have been shocked (in a very good way) at how popular it has been. I'm particularly glad that so many of you stuck around over the past couple of months when I wasn't posting as often as I had been. Some of you know that prior to rediscovering my interest in miniatures gaming back in the summer of 2011, I had been off work for 9 months with chronic fatigue. Over the last 18 months I had been back at work on reduced hours, but had hit a plateau at just under 70% of full time hours. Work then decided to make me push the rest of the way to full time over a very short period. That left me very tired in the evenings and I was spending most of Saturday recovering, leaving me just Sundays for any decent amount of painting. It didn't help that my body and brain weren't getting time to adjust to each increase in hours before the next increase kicked in. Fortunately I am now back to working full time and hopefully my body and brain will rapidly adjust to the hours and I will have energy in the evenings to do painting. plus various figures for my army camps and ambush markers. * 60 horses for my remaining Sarmatian lancers and 16 riderless horses for my 30YW dragoons. Now, using the points for Curt's 3rd Analogue Painting Challenge I calculate that out as 2862 points (excluding the camps/ambush markers) that I've painted this year. Unfortunately, there are a lot of figures that I started painting but never finished - they are still sitting in a drawer unit on my painting desk. I even took part in a tournament! I made it to 3 shows this year - Salute, Broadside and SELWG. I would have done Colours as well, but it clashed with the start of TUC Congress (at which I was a delegate from my union). Well, they've been up on Curt's blog for a good few hours, so I think it's OK to post them here now. I present to you 24 Croat light horsemen for my 15mm 30 Years War army. These were rather time consuming to paint as there was so much detail and I was using a lot of different colours. I think in total these took me about 12 hours of painting, plus another two hours for doing the basing. I'm pleased with the results - they're certainly a colourful bunch, as they should be. Now I've just got to decide on an army list in FoG:R where I can use them and get them onto the table! Well, I've had quite a productive day. This morning I finished off the Croats and sent the pics to Curt to post on his blog as he gets first shout on posting them. I've scheduled a post to go up here tomorrow. Errrmmm, today - it's gone midnight! Tomorrow evening I'll be doing a round-up of 2012. I notice that I'm currently at 299 followers - wouldn't it be great to gain another before the year ends? OK, this post is a couple of days late - I got back to London on Thursday afternoon. Since then I have been cracking on with painting my first unit entry for the Challenge - 24 15mm Croat light horse for my 30YW army. In contrast to my rather muted Ronin, these figures are a veritable riot of colour, which is part of the reason for it taking me so long to paint them. I finished the painting this evening, gave them a Klear/ink coat and have based them. Now I'm just waiting for the gunk to dry so that I can dry-brush it, then in the morning they will get their matt varnish spray and will be tufted, flocked and photographed. Depending on how quickly Curt gets the pics up on his blog, they might make an appearance here tomorrow, but more likely on Monday. So, what's next? No painting for a couple of days unless I finish off the FSE ships and/or the Norman knight. It will mostly be prep-work to get the next batch of figures ready for painting. I'll probably assemble a ton of 28mm plastics (Vikings, Saxons, Normans) for my Saga armies. Well, here you go, my first entry to the 3rd Analogue Painting Challenge is my "entry fee", a lovingly painted 25/28mm Samurai figure which will shortly be wending it's way over the Atlantic to Curt. The figure is a mid/lat 1980s Citadel Miniatures Samurai which I must have bought when I was still playing D&D. I never got round to painting it back then and found it last year after I'd got back into gaming. Painting this figure was fun. After gluing the figure onto a 32mm washer I added basing gunk and a couple of small rocks. Once the gunk was dry, the figure received two thin coats of Vallejo white polyurethane primer and after the 2nd had dried a thin wash of black paint was applied to the whole figure. When the wash had dried, I dry-brushed with off-white. the idea was for the black to provide deep shading and the off-white to provide natural highlighting under the thinned down paints I would be using. The sword blade and chain mail sleeves were undercoated with black. The metals were done by dry-brushing successively with Gunmetal Grey, Oily Steel and Silver. The guard-piece was dry-brushed with Old Gold. Painting was done using thinned down paints, getting progressively lighter and thicker. Guessing that the other participants would probably go for riotous colour schemes for their samurai, I opted to do something a bit different and went for a rich dark brown for the trousers and a golden-brown for the jacket/vest. I reserved bright colours for the sword hilt and scabbards. The base was mainly done by dry-brushing after an initial thinned coat of Flat Earth, using Iraqi Sand and various greys. The rocks started out black, with successively lighter shades of grey being used to highlight it. Once painting was complete, the figure was sealed and shaded with my usual Klear/ink mix, then sprayed with matt varnish. I then used brush-on satin varnish on the cloth and hair, and gloss on the sword blade and scabbards to make them "pop". After varnishing, the base was given a final dry-brush to tone down the effects of the Klear/ink coat, then tufts and flock were added. I'll be back home on Thursday, and will have to crack on with my first batch of figures for the Challenge - the Croat light horse. I'm hoping to get them finished before I have to go back to work on the 3rd. And in line with the festive spirit, some music vids for you. Ok, that's enough of that for now. Put down the egg nog, stop scoffing those Twiglets, put down those nutcrackers and enjoy these pics. These fellas will bring all 6 of my foot regiments up to 9 bases (for use as early war "Late Tercios"). That gives me 3 batteries of artillery. The only "gunnes" I'll need to paint up now are some regimental guns to enable me to do late war armies (Swedes in particular). I probably will add a couple more regiments of pike and shot at some point, the regimental guns I mentioned earlier and I have 2 more regiments of horse waiting to be prepped and painted. I finished painting Curt's ronin last night and this morning I did the matt spray, touched up the basing with another drybrushing, added some tufts and flocked it. Once that was done I went over various parts with brush on satin and gloss varnish to make them pop a bit more. I can't post pics just yet (comp rules) but will schedule a post for Boxing Day. What? She's Actually Finished Something? Well, I did say in my last post that the cuirassiers were finished and I was just waiting to matt-spray them and do the flocking and tufting. I actually managed to get that done today. I've also finished painting and have based the artillery and pike & shot figures I was working on. I might be lucky (and brave) and do the matt-spray this evening and perhaps even the flocking and tufting on those as well. If I do manage to get them finished before lunchtime tomorrow, I'll post pics of them as well. These are the 5th and 6th cuirassier regiments for my 30YW army. I've worked out that the only way I'd be able to field all 6 regiments is as part of a 900 point army, due to the minima for other troop types. As the "entry fee" for the Analogue Painting Challenge, each participant has to paint up a samurai figure for Curt. I've started work on mine - a 1980s Citadel samurai figure. the figure was primed with Vallejo white polyurethane primer, washed with thinned black paint (to provide deep shading in the folds and recesses) then dry-brushed with off-white. Metals and the hair were given a basecoat of black. I've done the first coats all over using thinned colours. jacket, trousers, boots hair and flesh have received their second coat as well. 24 figures as my first unit entry into the Challenge. I'll be starting these later in the week. Expect to see a very brightly coloured bunch of horsemen. 32 casualty figures; 24 late war horse; 6 limbers and teams; 6 mounted standard bearers. All of these need to be prepped first - probably a job for between Christmas and my return to work next Wednesday. As these are historicals, they'll count towards the challenge. Unfortunately I can't post pics of these until after they've been posted on Curt's blog so it may be a while before you get to see anything. A week since my last post, so about time I posted an update, if only to let you know I'm still alive! Curt has asked all 47 participants to set themselves a target for how many points they want to get painted. This was quite tough for me to determine - having increased my hours at work (finally back to full time), I obviously don't have as much time for painting as I did earlier in the year and on workday evenings I'm usually too tired to want to paint - hopefully this will improve once my body (and brain) have had a chance to get used to working full time again. So, what painting do I think is manageable? I reckon that I should be able to paint (in 15mm) 24 foot or 12 mounted a week if I apply myself to the job. So, that's 48 points per week. Over 13 weeks that would be 624 points. As I want my target to be a bit of a stretch, adding 25% would give 780 points, which rounds up nicely to 800 points. My New Model Army was matched against Brian's Confederate Irish army. Unfortunately due to a combination of really bad terrain placement (I'd lost the initiative and Brian had chosen "Hilly" as the terrain type) with two steep hills in my centre, really bad dice at crucial moments and me bottling it when I should have charged my horse into his right flank I ended up losing 25-0. I did start taking photos but then got so caught up in trying to work out how to extricate my cavalry from the noose that was closing in on them and how to get my foot through the gaps between the hills that I forgot to take any more. I'll post a few on Tuesday if I remember. I'm now hoping to redeem myself with a massive win against Simon's 1642 Royalists tomorrow night. 30YW Cuirassiers - I've finished the paining, done the Klear/ink coat, based them and dry-brushed the basing gunk. I'm hoping to do the matt varnish spray tomorrow morning (otherwise I'll do it on Tuesday) then I'll be able to do the tufting and flocking one evening this week. 30YW artillery - I started painting the guns a few weeks ago, then put them to one side. I've now finished the guns and have nearly finished painting the crews and bits. 30YW Foot - I've also got quite a bit of the painting done on the extra pikemen and musketeers for my foot regiments to upgrade all of them to 9-base late tercios. If I'm lucky, the artillery and foot should be finished next weekend and then I can start on my "Croats" which will be my first entry in the Challenge. I'm not sure what I'll paint after the Croats. I'll probably do the remaining 30YW figures that are in my leadpile. Last but not least, last weekend I reached the 50k milestone. If I'd reached that number a few weeks earlier I might have done a prize draw to celebrate but as my blog's first birthday is only a couple of weeks away, I decided to wait for that. Last year, I followed the progress of some of the painters in Curt's 2nd Analogue Painting Challenge and was impressed by the legend....wait for it....ary output of certain people who were taking part. 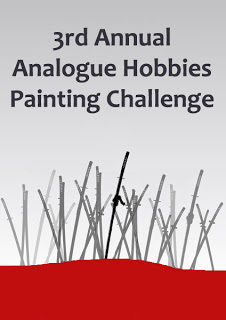 Anyway, Curt has announced the 3rd Analogue Painting Challenge and I have opted in. I have no hopes of getting anywhere near the output levels of Kent and Ray, even if my fatigue levels improve but the challenge will (I hope) provide a spur to getting some painting done. I've still got the bulk of the Baccus ACW start box to paint up. Given that next year is the 150th anniversary of the Gettysburg campaign, maybe it would be a good use of the time I spend on the Challenge to get enough units painted up to game some of the battles? Not to mention that the scoring system looks very skewed in favour of 6mm with each foot figure scoring 1 point (for comparison, foot figures for 15 and 28mm score 2 and 5 points). Maybe it's to compensate for the risk of eye strain? The entry fee for the challenge is to paint up a "47 Ronin" figure for Curt. Luckily I have some mid/late 1980s Citadel Samurai figures kicking around, so I just need to choose which one to paint up for him. I guessed correctly that Mike would have opted for the very shooty version of his army, so I was glad to win the initiative as it would let me see his deployment and deploy my own troops accordingly. As expected, his right wing and centre were a long line of foot, with a couple of units in reserve and dragoons covering the right flank. His left wing had his artillery, a pike and shot unit and his cavalry - 2 units of average horse and 1 unit of average cuirassiers. I opted for what could be a risky strategy and split my forces with a left wing of infantry (left flank covered by dragoons) and a cavalry right wing with the artillery covered by "firelocks". The main reason for putting my artillery on the right was to make use of the hill down there which would allow me to fire over my own troops. The photo was taken at the end of the 2nd turn. My battle plan was to engage and hold Mike's right wing with my foot, whilst my cavalry would engage his cavalry and then turn in on his left flank and rear. My artillery did quite well at first and managed to break Mike's cuirassiers through base losses. My superior determined horse were then able to get into position to engage his average horse. However, Mike had moved one of them up into a position that forced me to charge his pike and shot at the same time, which would put me at a disadvantage. The impact and first melee were tied, and dragged out to the end of the game. My other superior determined horse weren't quite in range to charge at the same time, so I had to wait 2 turns before I could destroy his other horse unit, leaving me free to engage in the other melee. Meanwhile over on my left flank, the two opposing dragoons engaged in a phoney war of threatening each other while my foot advanced to engage Mike's right wing. My superior foot succeeded in fragmenting their opponents through shooting and declared a charge - Mike failed the cohesion test to stand and the unit broke, upsetting a couple of units around them. The next unit down the line was charge by my foot and rapidly broke as well and I managed to kill one of his generals - revenge for me as on the other flank Mike had fluked a kill on my cavalry general. This disturbed Mike's right wing even more. In the pursuit phase the foot who had won their melee managed to charge into another foot unit. This was to prove disastrous for them as it left them open to a flank charge which I couldn't prevent. Back on my right wing, my artillery couldn't engage any targets within arc as my cavalry were in the way. Stupidly I forgot for a couple of turns that I could pivot them onto a new arc. When I eventually did remember, I got in one shot against the unengaged end of Mike's foot in the melee but Mike decided to use his artillery for counter-battery fire and managed to hit with both dice (a 1 in 9 chance). If I rolled a 1 on my death dice my artillery would autobreak. Guess what I rolled - yup, a 1. Artillery gone, my first losses (apart from a general and a couple of bases) of the game. In the cavalry fight, the SDH who had only charge cavalry won their fight and made a token effort at pursuing the routers. That was good for me as it allowed me to turn them and move them to a position where they could join in on the other melee. Things got even better as my other SDH unit broke their cavalry opponents, allowing them to spill round and concentrate their dice on the pike and shot unit, now disrupted from seeing the cavalry break. Back on my left, Mike had managed to manoeuvre a few of his shot-only units into position to fire en masse against one of my foot units, which had already lost 2 bases from shooting. He managed to score 6 hits which meant an automatic base loss and my foot broke. And then it was the last turn of the game. My unengaged SDH charged in on the flank of Mike's pike and shot, dropping them to fragmented. unfortunately the impact was a draw so it would all come down to the melee phase - if I could break the foot, my pursuit would take my SDH into his (undefended) artillery and I would have achieved a rout. So, the melee phase was on - Mike rolled his 3 dice, scoring no hits even with a re-roll. I rolled my 8 dice, scoring 5 hits and 3 re-rolls. The re-rolls were all hits. Automatic base loss (taking him to 4 bases) and with Mike needing to roll a 3 or more to avoid losing a 2nd base which would cause him to auto-break. He rolled a 4. Damn! Still, there was only a 1 in 6 chance of him passing his cohesion test (needing a 10, 11 or 12) - he rolled a 10! Damn and curse and damn and curse! I've got my 3rd game lined up for this Thursday against Brian's Confederate Irish. Having taken a look at his list I will probably need to revise my own army list for this game. Norman knight - horse finished and some work done on the rider. The technique I use for 15mm horses does seem to work for 28mm as well. 30YW cuirassiers - almost finished, just gloves and sashes to do, then Klear/ink coat, basing, matt varnish and flocking/tufting. I should be able to get the cuirassiers done to at least the Klear/ink stage today and might do a bit of work on the Norman knight. Once they are done I'll finish the FSE ships and then it will be a case of finishing as many of the started-painting-bit-got-sidetracked figures as I can before the Analogue Painting Challenge starts on the 20th. I'm back! It's been interesting the last two weeks watching to see how many page views I got despite the lack of posts. It seems that I've got 50-100 people who take a peek every day. To those 50-100 people I offer my apologies for not having posted anything for so many days. I have been doing a little bit of painting over the last couple of weeks, but nothing worth showing just yet. My plan for tomorrow is to finish off painting the 30YW cuirassiers - there's not much left to paint now, but it might be a while before they are completely finished - the cold winter weather isn't conducive to opening windows to provide ventilation for spraying matt varnish! I've also done some work on the FSE spaceships - various panels have been painted red or white. I just need to touch up some of the blue, paint weapons, engine surrounds and the exhaust. The red and white panels do improve the look of the ships, but I'm still not sure about the colour scheme. I'll see how they look when I've finished painting them, but suspect that I might end up stripping and repainting them. As well as the above, I've also assembled one of the Conquest Norman Knights to see whether the technique I use for 15mm horses will work for 28mm horses. I'm pretty much finished on the horse (the technique seems to work OK) and just need to finish the rider. Well, that's enough of an update. Onto the book review. Imagine that a feral crew member warns you to stay away from the bridge and to avoid "the narrative"
Imagine that you don't want to die a pointless death as part of "the narrative"
Yup. I'm not a fan of dear Wil. However, I didn't let that detract from my reading of the book. The book was very well written (no surprise there) and absolutely hilarious as you read how the characters come to terms with what is going on and how they resolve to beat "the narrative". As you would expect from the title, there are references/homages a-plenty to Star Trek (ToS) and the story just keeps you turning the pages. I read it in an evening. However the ending was a bit of a let-down (although Chapter 24 - the last one - did make up for it a bit). And then I thought "Hang on a second, there are still a whole wodge of pages left in the book. What the heck?" There are three "Coda" after the end of the main story, written in the first person (a blog); the second person and the third person. All are worth reading. 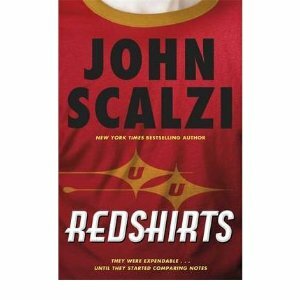 Over the past week I'd also read two other SF humour novels by Scalzi - "Fuzzy Nation" and "The Android's Dream". If you're unlucky I might subject you to reviews of those next week. 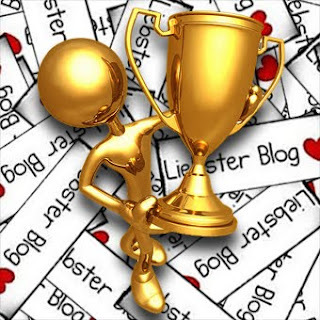 Another meme is doing the blogger rounds - the Liebster Blog Awards. the rules are pretty simple - if you have received one of these awards, you put a post up with a link back to the blogger who gave you the award, then award it to 5 other blogs that you think deserve it. So, Anne of Anne's Attic got given the award, then named me as one of her 5 awardees. Curses - now I have to decide which 5 blogs I follow deserve the award (that haven't been given it already). It's going to be very tough to narrow it down. Mike Whitaker over at Trouble At T'Mill - if for no other reason than his excellent and informative series of posts on horse colours and heraldry. Colonel Shofer's Mild OCD Model Blog - whilst we see very little of his own work, he does an amazing job of linking through to inspiring work on other peoples' blogs, youtube channels and suchlike. Frontline Gamer - for his Sunday Sermons if for no other reason. This blog is always entertaining and informative and he deserves kudos for all the work that goes into keeping it going. So, there you go. That's my 5 nominees for the award. I'm certain that I've overlooked some that are equally deserving. Okay, so it's been a week since I last posted. I'm still feeling very tired in the evenings after work which means I'm not in the mood to do much painting or modelling. In an effort to get a quick mood-boosting win, I decided to start painting up some of my GZG starships (well, they've been sitting in the box for a year or so). Ages ago, I'd bought some of the magnetic adapters from Ninja Magic to allow me to quick-fit ships onto flying stands. For painting ships, I'd figured it would be a good idea to fix some of the adapter bases onto long flight pegs that I'd picked up from Litko. The next step was to decide which fleet to do. The easiest option was to do the FSE starter fleet - 2 frigates, 2 destroyers, 2 light cruisers, 1 heavy cruiser and 1 battle cruiser. Cleaning these up wasn't too bad apart from the drive exhausts which had quite a bit of flash that needed drilling out. After fitting the magnetic adapters, I primed them with Vallejo black polyurethane primer, base-coated with Dark Blue, heavy-dry-brush with 50:50 Dark Blue and Light Grey, with a final light brush of 50:50 Dark Blue and White. I'm not totally sure about the basic colour scheme and don't want to go any further without seeing what people think, so here are some photos. For some reason, the photos against the black background have bleached the colours on the ships. Let me know what you think of this as a base colour. The scheme I'm looking at instead is a mid grey base dry-brushed heavily with pale grey blue, then some panels picked out in dark blue. Posting tonight in case I forget in the morning. In memory of all those killed in war, both military and civilian and of all sides. As you may recall, I bought a pair of 4Ground buildings from their 28mm Dark Ages range while I was at SELWG a few weeks ago. I've finished assembling them now, so here are my pics and thoughts. These buildings were easy to assemble and for the most part needed no reference to the instructions. The only fiddly bit was assembling the "fire box" for each building (the raised area of the floor) and the most awkward bit was attaching the smoke hood on the Anglo-Danish building. Being made of MDF, assembly only needed PVA glue, with the exception of the smoke hood - I used superglue gel to attach that. These were "pre-painted" models. The paint job is fairly basic, but looks fine for gaming. 1) Give the walls and any exposed woodwork on the roofs a brown ink wash to dirty them up a bit. I might also wash the teddy-bear fur thatch to give it a bit of depth. 2) Before adding the walls, I would probably do some work on the floor - add the fire box; coat the floor with basing texture; paint and wash the texture; coat the floor with dilute PVA and sprinkle chopped-up sisal string fibres over it. 4) Add "curtains" swept to the side of the windows. Would I recommend 4Ground's buildings based on my experience with these? Definitely. They are pretty cheap, easy to assemble and look good enough for gaming without any further work.